It's like man flu, and ladysolly has it. I know it's bad, because she was supposed to go out today to play bridge, and she cancelled. She also cancelled tomorrow, because she might still be feeling umpty. So I might have to cancel tomorrow, in case she needs me. 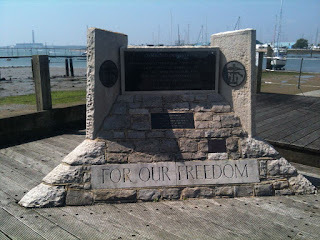 I was planning to go out caching, to finish off the Hamble Ramble (near Southampton) and get the bonus, and to make a bit of a dent in the "Auf Wiedersen" series. No problem, I can do that any time. A few more bits and pieces arrived today - the mini spade fuses (for the car) and a green-LED voltmeter, because I think it might be more visible in daylight than the red one. That's for the bike I'm going to be building when the wheel from China arrives. I ordered it 5 weeks ago, it's been in transit for a month now, and no sign of it yet. I got a phone call today - the caller said she was phoning for Barclaycard. She was actually with GFKNOP, and gave the Market Research Society as willing to vouch for her. They said that they knew GFKNOP, but didn't know if Barclaycard had hired them - why would they? So I phoned Barclaycard, who said that they hadn't asked anyone to call me. So I told the Market Research Society about all this. Then GFKNOP phoned me again, and this time I let them ask some questions. "Are you the decision maker" was the first one. It's a cardinal rule in sales - you don't waste your time talking to anyone except the decision maker. Then they asked who my card processor was, and how much turnover I had. Barclaycard, of course, already know all this. My theory? It was a sales call, masquerading as market research. I've told the Market Research Society about this, and left it to them to decide what their actions should be. And I got a spam email from Oracle, inviting me to a meeting of the Oracle User Group UK. So I called the OUGUK and told them that Oracle is bringing them into disrepute by spamming on their behalf. They're going to look into it. Now I need to feed the HMRC with their monthly data feed. I just updated the IOS on my iPhone. I don't usually update things unless there's a good reason to - I've seen far too many times, where an upgrade has led to stuff not working. But for the iPhone to be a bit more useful, I need the GPS to update more often than once wvery few minutes, and I can't see a way to make that happen. Maybe upgrading IOS will do it? Now that I've got more than two people reading my blog, there's the possibility of having occasional polls on topics of interest. What do you think? There's a poll so you can make yourself heard. A very rainy day today; I'm glad I stayed in. The Jeep multitool that I ordered has arrived, and it's rather nice. As well as the pliers, knife and usual assorted useless stuff (bottle opener etc), there's a set of socket screwdrivers and hex wrenches. A bit of bike maintenance. I checked the brakes, they don't need relining yet, oiled the pedal folding mechanism and chain and the bike is ready for tomorrow, when I'm planning a ride around Hamble, Southampton. And in July, we're going to visit Peppa Pigg's World! I'm looking forward to Miss Rabbit's Ice Cream Parlour. I shall find myself a place to sit down, and pig out with a good book. To Wycombe today; ladysolly begged off because of a bad back, although she's recovering now. As soon as I got the bike out, I noticed that I've got a wobbly front wheel. "Oh no," I thought, "not the bearings again!" But it wasn't. 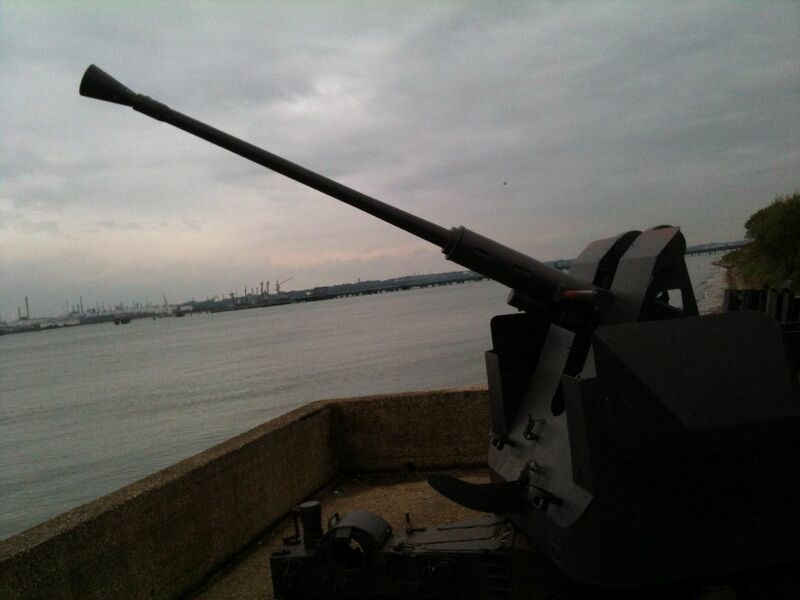 I just hadn't tightened the hub nut properly; a few tugs with a suitable spanner and everything was fine. I wonder where my wheel from China is? It's not here, that's for sure. I ordered it April 22nd, it left Hong Kong on May 3rd, and that's all I know. It's too soon to start worrying, though. 26 caches done today, and a very pleasant day out. Out again today with ladysolly. We got to the parking place, and it was at that point that we realised that I've taken her boots out of the car. Oops. So we had to go home to get her boots; fortunately, not terribly far. Then round two loops; 21 caches done today. It's all over the internet, and I was pretty much ignoring it, because we all know that just because something is on the internet, doesn't mean it's true. But today it was in the Times! "The waiting is over as teenager invents gadget to charge a phone in 20 seconds"
I've noticed that many people, especially journalists, fail to apply the "should I believe this?" test. So let's give it a go. A typical mobile phone battery is 1200 milliamp-hours, 3.6 volts. That means that if you take 1200 milliamps out of it, it will last an hour. Or, if you put 1.2 amps (that's 1200 milliamps) into it, it will take an hour to charge up. If you want it to charge up in a minute, you'd need to put 72 amps into it. If you want it to charge up in 20 seconds, you'll need to put 216 amps into it. Your house wiring is rated at 13 amps. Some parts of your house wiring (for cookers, for example) will be rated at 30 amps. The wiring coming into your house is probably rated for 100 amps, and is VERY THICK. To carry 200 amps, you want wire that's about as thick as your little finger. Two of them, one for positive, and one for negative. But then you're going to connect that to the tiny connectors on your mobile phone? I find it extremely difficult to believe that someone is going to put 216 amps into a little mobile phone battery. I also find it extremely difficult to believe that if someone does try to do that, that the battery, the wiring (or even the intrepid phone user) will survive the experiment. But now let's think about the internal impedance of the battery. If the battery has 200 milli-ohms, it's in good condition (http://www.buchmann.ca/chap9-page3.asp). That's 0.2 ohms. To get 216 amps into it, you'll have to give it 43.2 volts. If you give a 3.6 volt battery 43.2 volts, the results will be pretty sad, maybe even spectacular. OK, let's dispense with the battery, and let's just put this "super-capacitor" into your mobile phone. Same problem. To charge it up in 20 seconds, you need to put 216 amps into it. You still need those gorilla-sized wires. I believe that the girl in question has made what the media call a "super-capacitor", which is what I would call a "capacitor". And that you can charge that capacitor in 20 seconds; that I believe, because you can charge pretty much any capacitor in 20 seconds. But I doubt if it's 1200 milliamp-hours, and someone has leapt to an unsupportable conclusion, and no-one, pretty much no-one, has asked anyone who knows anything about electricity (and really, you don't need to know an awful lot, it's just simple arithmetic) whether this exaggerated claim is possible. And Eesha Khare, the teenager in question, has just learned an important lesson about the media. Namely: "Don't believe anything you read in newspapers, because they don't check facts". Ultra-capacitors have been around for a while. They can indeed be charged really fast. But they'll store only 5% as much energy as a Lithium battery. So you'll need a REALLY BIG mobile phone to use them. My guess is that Eesha has come up with an improvement on that 5%. But we'll probably never know, because the media have so distorted this news, I donn't know how to find out. Off to Shelney today with ladysolly and my New Boots, to do two small rings. Nice weather, and we found 23 out of 24 caches. The new boots have arrived, and I think they fit perfectly! And they're heavy leather tops, and waterproof, and they were under £40, and I think I'm very pleased with them. I'll be sure after I've gone out walking in them, but if they're as good as I think, I'll be getting more from the same source. So buying boots over the internet isn't such a crazy idea. Why are there zero VAT rates for foodstuffs, books, pharmaceuticals, medical, passenger transport, newspapers, children’s clothing? Yes, I've heard the argument that these are "necessities, not luxuries". But look at the other countries in Europe that apply VAT. Hardly anyone else has a zero VAT rate; only Malta and Ireland, and there might be some British influence there. I think it comes from the old concept of "purchase tax", where the rates depended on who "luxurious" the goods were. But it just doesn't make sense to me (especially the idea that books and newspapers are a necessity of life). And anyway, the whole concept of VAT isn't about how "luxurious" things are. It's purely about their value. And a reduced rate for domestic and charity-consumed fuel and power? Property renovations? Quit-smoking products? I just don't see any good justification. We should put 20% VAT on everything. I had hoped to go out caching today, but I had a bad night on account of a painful tooth. This morning, I phoned the Dentist, and they suggested I come straight round. So I did; he had a look, and told me that I had a starting abscess on that tooth. Bad news. He filed the filling down a fraction to reduce the pressure on it, gave me a prescription for an antibiotic and I have to go back on June 11 for a root filling, and then again a week later for a finishing-off filling. I don't enjoy these, but they're tolerable. Today I rode the bike around Brackley, trying to get all the caches in the town. I got nearly all of them. The most enjoyable ones were caches that required me to solve a puzzle after I'd found the cache - one was a box that you had to work out hw to open, another was sliding blocks, one was a maze, and the best one was a screw thread with two ends, and two nuts that you could turn. Then on to the BBH event in Aylesbury, with ladysolly and many other cachers. A total of 40 caches today. Tax avoidance and tax evasion - who's the villain? Much is talked these days about Google, Amazon, Starbucks and many other corporations because they aren;t paying as much tax as we'd like them to. Because they legally avoid taxes. Whose the villain? The UK government, supported by the media, are blaming the corporations. But the corporations are following the rules that the governments have made. If they weren't, they could be prosecuted, fined, thrown into jail, whatever. So whose fault is it that the law isn't what we want it to be? Parliament makes the law. So parliament is to blame if the laws aren't what we want. Margaret Hodges accuses Google of using smoke and mirrors to avoid paying tax. The true culprit, is Hodges and her ilk, the other MPs, who are using smoke and mirrors to deflect the blame from those who have made tax laws that we don't think are right, onto the innocent victims, the corporations, who are complying with those tax laws, and paying as little tax as they legally can. I too, legally avoid paying some of the taxes that I might otherwise be paying. I have Premium Bonds, issued by the government, and the revenue that those generate for me is tax free. Similarly, the ISA - here's a quote from the HMRC web site. "An ISA is a type of savings account. Basically, if you save in an ISA you are entitled to keep all that you receive from that investment and not pay any tax on it." Am I evil for taking advantage of the schemes that the government offers and promotes? Of course not. So why should anyone else be evil for paying as little tax as they legally must? If we don't like the way this works, we should change the law. Not blame people and corporations who are complying with the law. Down to London today to celebrate grandson.1's second birthday at Vauxhall city farm. While there, I picked up the associated cache. I had coronation chicken sandwiches, strawberries-and-cream and birthday cake. Yum! I feel the need for a new pair of boots. The ones I wore today are probably my best pair, but they're going home (there's a split in the upper), and today they hurt my feet because they weren't flexing properly. I do a lot of walking, and foot comfort is really really important to me. Does it make sense to buy walking boots over the web? I don't know, but I'm about to find out. I want them to be waterproof, durable and a good fit. First I went to Ebay, and there was a huge selection. Too huge. And no customer reviews for the products, only for the vendor's reputation. But I want to know about the boots. Then I went to Sports Direct. I found a few likely pairs, but when I looked at the customer reviews, most of them were rubbished. After a bit more research, I found out that Lonsdale Sports owns the Karrimor brand. Lonsdale Sports also owns Sports Direct, so A) it isn't surprising that Sports Direct sell Karrimor products, and B) the great reputation that Karrimor had, seems to have lessened. So then I looked at Hi Tec, and specifically the Hi-Tec Men's Eurotrek WP. That has had great customer reviews. I went to Amazon and there it's had rave reviews - also, Amazon was a few pounds cheaper. So I bought a pair of dark brown size 12s from Amazon for £32.94 (including delivery), and I just hope they fit. Out with ladysolly today, to do the Wineham Wander, 22 caches (including two which are archived but which are actually there), all tricky, no hints! We managed to get them all, but it was a struggle, and one of them needed a PAF. By the end of the walk (5 miles) ladysolly looked like she needed a battery change, and I need a new pair of boots, I don't currently have a really good pair that fits and is comfortable. Maybe I'll have a look on Ebay. Up North today, to do another big ring; 56 caches, plus two extras. And I finished at about 5pm, so I had time to do several more. I chose my parking position carefully, so that I'd be able to get back to the car quickly after about 2/3 of the circuit. That meant that I could have lunch and a short rest at about 2:30; it also meant that I could swap out battery 6 which was empty, and take with me battery 7. Because I had a problem today with battery 6; when I went to put it in the car, I could see that it was only partially recharged. So I took the charger with me, and plugged that into the car cigarette lighter. But the power drawn, blew the fuse on the cigarette lighter circuit, so I couldn't run the satnav or recharge the Loox ... except that I have with me an extra car battery (from Halfords) which I carry in case the car battery gets so run down that I can't start the car. It also has an air pump, which has been very useful, and a power point, cigarette lighter style. As it turned out, battery 6 was about 2/3 charged, so I was able to do 20 caches using it, and the other two batteries saw me through the day. As I was getting ready to kick off, I saw a couple acting very suspiciously - they were Spindlewood, who were doing the same route today. They'd started at number 1, logically enough. Also, they were going the opposite way round to me, and sure enough, we met again at about 2pm. 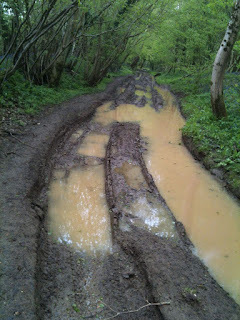 There were a *lot* of stiles on this circuit, and I had to do a lot of heavy lifting, but the worst part was when I moved out into a field, and got totally bogged down, the mud jammed into the wheels, after ten yards. It was a major effort to get back to the edge of the field, where I dug out most of the mud, and went a different route (a long way round, but on terrain that I could actually navigate). Later on, there was one cache without a hint, and that, of course, was the one that I just could not find. But I persisted, and eventually found it in a place I'd nearly checked in the first place. To finish off, I did six caches put out for the "let's go Green" event in Barnwell Country Park, a nice little bike cruise around. A total of 68 caches, and one DNF. Today was forecast to be a bit rainy, so I decided to do several short rides, so that I could take shelter in the car if necessary. I went to the Meon Valley. Quite a lot of the track was like this, and I was walking the bike instead of zooming along. Eventually, I got to the road, and then I could really move fast. And tightening up the spokes was exactly what the bike had needed, that terrible wobble has gone! Also, the LED voltmeter display is actually quite good, it's only in direct sunlight that I can't read it. I think I'll put a shade around it. Then I moved on to another circuit, about a dozen caches of the "cycle round" series, which I cycled round. And then on to a disused railway - I always love biking along these, because the track is usually excellent, and you can be sure that there's no cars. Us cyclists don't like cars, nasty hard things that can knock you down and kill you. And there was some excellent caches along there, including one that needed me to get up a 60-degree bank (the only way up was to backtrack and come up a different path), then find the apparatus, and then wind the cache down, sign the log, and wind it up again. Finally, I went to Old Winchester Hill, to do a very old Esscafe multi. 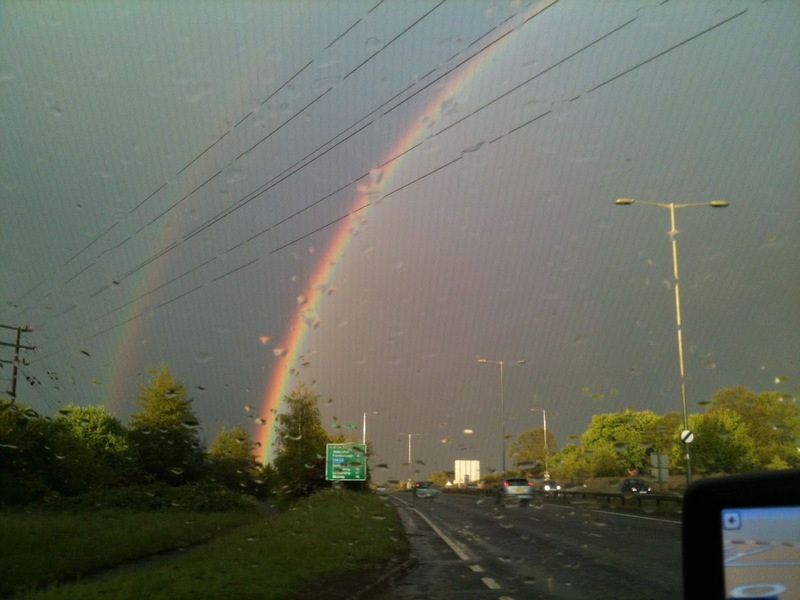 You can see the double rainbow, and you can see how the outer, fainter rainbow has the colours reversed. You can read about this effect in the wiki. I found a spoke tightener on one of my bike multitools, so I used it to tighten up the spokes on my front wheel. I can't understand how they got so loose. The back wheel seems fine. I also checked the brakes - new brake pads not needed on the back, but I replaced the front ones, because I could see metal where there should have been rubber. I'm still waiting for the new wheel from China. The voltmeter I put on the bike works OK, but when it gets wet it displays 37 volts, a silly number. It isn't as useful as I'd hoped. The good news is that it does, as I expected, show a gradually declining voltage. But I can't read it in sunlight, the red LEDs are washed out by the light. However, I can read it if I shade it with my hand, so it's not too bad. I had a big problem on Sunday on the bike. I stopped, and used my left foot to push down the kickstand. But in doing that, somehow my bootlace got caught on the back rack. So I could put my right foot on the ground, but not my left foot, and I couldn't dismount from the bike. I was left sitting there for several minutes while I tried to disengage my boot from the bike, kicking backwards with my left foot without really being able to see what I was doing, and I was in grave danger of falling over for a while. A runner sped past, and I seriously thought of asking him to help me - but I didn't, and managed to get free after a while. Yesterday, as I was whooshing along at about 20 mph, (downhill of course, I can't get up to that sort of speed on the level), a woman in a car stopped and started to wind her window down as I sped past. Did she expect me to slam on my brakes in order to be able to tell her that I had no idea where it was that she was about to ask me directions to? Well, I didn't, I just whooshed on, and if she thought I was rude, let me apologise to her here and now. I heard my third cuckoo of the year. 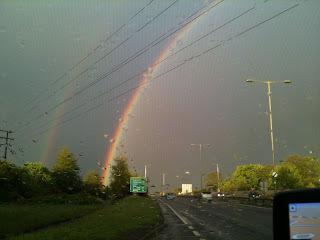 On the way home on the A3 near Guildford, I saw a triple rainbow. I don't think I've ever seen a triple before. The main rainbow was extraordinarily bright, and I could see the complete arch, and there was a secondary rainbow just outside of it. And there was a third rainbow, again outside the main, but a distance from it. I wish I'd been able to stop and take a picture. Dentist today. A slight chip in a tooth; he filled it with hardly any drilling and very little fuss, and it feels OK again. To my immense delight, I weighed in at 14 stone 11 pounds this morning. I'm not that for from 200 pounds now! A fun day today, near Petersfield, on the bike. First I did the Pig Whistle Trot; 13 caches in a small circuit. Halfway round, I took the wrong track, and didn't notice that I was on the wrong side of a severe barbed wire fence until I'd gone quite a way. So I lifted the bike over a five-bar gate, found a place in the wire that I could climb through, and managed to continue. But when I got to the part where I could race along the tarmac, I noticed that the front wheel was wobbling quite a lot. It wasn't the bearings, it wasn't the forks, and it was quite a while before I realised what it was - rather a lot of the spokes were very loose. So I tightened them by hand (that's how loose they were) and when I got home, I did a proper job on them. I'll test it tomorrow. Then another circuit, the Froxfield Frolix. This was a mixture of mostly trads plus a few multis, with a bonus. Halfway round, I was searching for a cache under a mossy log, and there were only half a dozen possibilities, and I just couldn't find it. And then a voice called from the road. "Are you looking for the box?" I couldn't claim to be counting the slugs, so I admitted it. "I've got it, I took it home". It turned out to be the landowner, who was a bit annoyed that no-one had asked his permission. So I schmoozed him a bit, and followed him back to his home, and he gave me the cache, and said that we could hide it on his land. And then I found that the kick-stand on the bike had come adrift, and was sticking out like a trafficator, and I didn't have any tools with me. But the route I was going took me about a kilometer from the car, by road, so I whizzed back and did the repair, sheltered from a bried rain shower, changed the bike battery, and then got back to the series. Usually, I carry a few tools with me, but for this series, I left my saddlebags in the car, so no tools. Isn't it always like that? I hardly ever need them, but when I do, I don't have them. Later on in the series, I needed to go across a planted field; there was a footpath across it, but it looked unused. I decided that I could probably manage without the piece of info that going there would get for me. So I did all 19 of the caches, and then went for the bonus (missing one number), and I'm glad to say, I found it! But by that time, it was getting a bit later than I'd expected, so I did a quick circuit of five caches on foot (and I was very glad I didn;t take the bike, because one of the stiles was what I call "Difficulty 5", meaning, almost impossible to get a bike through. So, a total of 42 caches today, and no DNFs. I started off on the wrong foot - I went to the big Tesco for my lunch sandwich, and it was, of course, closed, it being Sunday. Then I drove to my starting position; the weather looked great, but the forecast was for rain in the afternoon ... and the forecast turned out to be correct. First, I parked tidily, off the road, and started to get ready. I had the bike out of the car, and I was just getting the GPS set up when a Landrover pulled up next to me, and an old gent wound his window down, so I wound mine down. "Yes, fine thanks," I replied. I don't feel the need to do any more than answer the question asked of me. But that probably wasn't what he was expecting, because he looked a bit baffled, thought a bit, and then asked me "Are you OK?" again. "Yes, fine thanks," I replied. I didn;t see anything that had changed so I didn't change my answer. So then he thought a bit more, and after a little while he said "You're parked near my land" Well, A) that's not a question, so doesn't require an answer, and B) although I was, I dare say, near his land, I wasn't *on* his land, I was on the grass verge, which is, I think, owned by the Council. But I expect he'd hoped for an answer, because he followed up with another question. "What are you doing?" Wewll, he probably could have spotted that my bike was out and very close to my car, but maybe he didn't realise it was my bike, it could, I suppose, have been anyone's. Or maybe he just hadn't noticed it. "I'm planning to do a bike ride," I explained. "Ah," he said. "You see, there's been burglaries round here. So I was just checking up. No problem," he said, cheerfully. My turn now. "Can I ask you a couple of questions?" I asked, assuming that that question wouldn't be one of them. "Yes?" he said. "Well, I guess you ask everyone what they're doing - how many people have admitted that they're about to burgle some houses nearby?" He looked at me strangely. As if anyone would come out with that! "No, no-one has said that." "OK," I said, nodding, as of one who isn't surprised, "and my next question is, have you written down the registration number of this car?" "No," he said. "Huh," I said. "My third, and I promise you it's my last question - have you spoken to your local police and asked them what you should do if you see someone parked on the grass verge close to your land and you're concerned that maybe they're intending a burglary?" No, he hadn't. "Have a nice day," I said, and he drove off. I'd like to think, he was slightly wiser. So then I got on the bike and did 70 caches, four DNFs. Near the end, I had to make a choice - ride through what looked like a quite broad lake, or try to get around it by crossing a small stream that was pretty much invisible under the tufts of grass. I chose to cross, and got two bootfulls of water and wet up to my knees. It's just as well that A) it was fairly warm today and B) I was pretty wet already from the rain and C) it wasn't far back to the car. 课程贯穿案例分享，详细讲解目标客户 ? 客户要求 ? 客户需求 ? 产品包需求 ? Using Google Translate, I find that it's in Chinese; this one is selling a list of email addresses for spamming. It's pretty easy to filter out this sort of spam, of course. There's also some from Japan and Russia that use character sets that I'm not very familiar with. I say "not very" because A) I did actually spend a couple of years learning Russian, at school, and B) I used to need to translate statistical infomration from Japanese. This isn't new, but I'm seeing spam now that's more polymorphic than I've seen before. About 20 years ago, Fridrik Skulason and I were the authors of pretty much the only scanners that could make exact identification of viruses. I did it by checksumming the static ranges of the code. That meant that it was particularly important to both of us to use a single agreed name for all the viruses, and in a very long phone call one night, we got that all nailed down. At the same time, we agreed a few technical terms, and "polymorphic" was one of them. THis is the word we used for viruses that were encrypted, and the decryptor was highly variable, so that if you put two instances of the virus side by side, you couldn't see any common string of bytes. That cause many scanners a problem (including mine), until I developed a thing I called the "Generic decryption engine" (but that's a story for another time). manager who snaped 42% of L. Gate and got USD 1 Bill you fund small studios. The deal precisely like that is GTR_L. This pick shows all signals to grow. fast begin buying 130'000 shares of GTR_L on May, 13! shares of G T RL on Monday May 13.
firms. Buy now begin buying 100'000 shares of GTR_L on May 13th. fast start adding 150`000 shares of G_T_R_L on May 13. How to profit USD 1'000'000'000 in cinematic production investment?! you invest newer players. The pick acurately like this is G_T_R L.
150000 shares of G_T_R L on Monday May 13! shares of G_T RL on Monday, May 13th, 2013! And so on, and so on. As you can see, it's difficult to pick a series of words that reliably flags this spam. And, of course, this is being sent out by a botnet, which means that each email comes from a different place. It's not as bad as you might think. The two possibilities "Lions Gate" and "L. Gate" works quite well. Or you could look for "GTRL" without spaces or underlines. And, unlike with viruses, it's not really a big deal if you fail to spot the occasional spam. On the other side, the spammer has made his campaign significantly less effective because most of the emails that are being sent, are pretty much incomprehensible. By the way, this is a "pump and dump" scam, in case you were wondering. Both ladysolly and I are feeling a lot better today. She's stopped feeling nauseous, and I don't ache all over any more. Different symptoms, but I'd guess we had the same bug. I'm planning to go out tomorrow. I hope it doesn;t rain too much! I think I have man flu. My back aches, my arms hurt, and this isn't from excessive exercise. I'm not getting much sympathy from ladysolly, who has woman flu, although she's not as bad today as she was yesterday. Today was a quiet day, a day of rest. Plus, ladysolly has a bad tummy. So I installed the voltmeter on the bike; now I'll know the exact voltage of the battery at all times. This should be a better guide than the 1-to-4-blobs of the display it came with. The 20-inch wheel bike is even worse, the indicator is green-yellow-red. I've ordered more voltmeters (at £1.25 each!) and I'll put one on each bike. The wattmeter also arrived. I'll install that when I install the wheel that's on a slow boat from China. Tomorrow, I'm planning to go back to the Great Cotswold Walk; maybe I'll be able to do all the ones I didn't do yesterday. Or maybe I won't; I read one log of someone who went round all 130 is 10 hours. I simply couldn;t do that, I'm not that fast a walker. But I might be able to do 80. Fortunately, it's two loops, one of 50 and one of 30, so I'll do the 50 first, and then see what time it is. Since I broke my favourite Loox by slamming the tailgate down on it, I've ordered a replacement. These Looxes are about 10 years old now, and no-one wants them any more, so they're quite cheap. This one is a Loox 718, which is the same as the 720 but without a camera. Since I haven;t used the camera on the Loox since I got the iPhone, that's not a problem. It arrived today, and I'm loading it up. And an extra blessing, it came with a little aluminium case, which is perfect for protecting it from rain, dropping and even, if I'm really lucky, slamming the tailgate down on it. I still think that a Loox 720 (or 718) makes a perfect PDA to use with a bluetooth GPS for caching. The battery lasts for about 7 hours (and is easy to switch), it takes a CF card that can be 8 or even 16 gb, so it'll take all the maps, and it has a 640 by 480 screen (most such devices are 320 by 240). Strangely, I seem to be the only person who thnks this. There's a series of 130 caches in the Cotswolds. I know I won't be able to do them all in one day, but today I travelled there and chewed off about a third of them. There were a couple of DNFs, but I got a total of 62 caches today, mostly while going round on the bike. I was last here about 55 years ago, on a holiday with my mother. I remember the local lending library wasn't very good. So I came here today, first to do a series that looked quite interesting; 15 caches on roads, followed by 11 more on footpaths, and for those 11, the coords for each cache is given in the previous cache. The first of the caches with coords that aren't given, has its coords in some of the first 15. I DNFed one of the 15, and by the time I got to near the end of the 15, I still didn't have the Westings, but in the very last cache, I got lucky! So then I went off the road to do the puzzles and multis; all found. And along the way, I picked up four additional numbers that turned out to be necessary to open a lock. A very good series! Then I went on to Selsey itself for another dozen caches. This was the first outing for the bike with the transplanted wheel, and it worked fine. But I did have a disaster; I left my PDA on the back bumper of the Freelander, so that when I closed the tailgate, it smashed the PDA. I did have a backup PDA with me, I'm glad to say, but I've just broken my best PDA. Oh well, spilled milk. And it does show me what a good idea it is to always have a spare PDA! And GPS, by the way. On bike A, I had a front wheel motor that worked, but the bearings that support it were very loose (worn, I think); probably need to be replaced. I don't know if that's actually possible. On bike B, I had a motor that worked only in fits and starts, but good bearings. So, I took the motor from A, the bearings from B, and assembled a good front wheel, put it on bike A, and wired it up. The above sentence summarises a few hours of work (some of it mechanical, some electrical) ... but once it was done, it worked, and I now have a full-size bike (26 inch wheel) that works very nicely (I also adjusted the return spring on the front brake). For bike B, I now have a front wheel on wobbly bearings, and a motor that doesn't work. But I have a front wheel and motor coming here on a slow boat from China. When it arrives, I'll let you know, but that should give me a working bike. And I still have a working 20-inch wheel electric bike, which will become the first reserve, in case anythng happens to bike A.
I'm pretty pleased about this! After our experience yesterday in the M25 traffic jam, we decided to go local today. We did two Captain Jack rings. The highlight of the day was seeing an albino peacock. Its plumage was entirely white! And then it did its display, which was quite spectacular. 22 caches done, one DNF. Ladysolly really enjoyed the Devil's Dyke series, especially the part where I lowered her into a well and then lifted her out again. So we decided to do the similar series in Arundel. But first, we spent two hours on the M25; we'd both forgotten that it's Bank Holiday weekend. So we didn't get started until 2:30 pm. Ladysolly hasn't done a circuit for quite a while, so by the time we got to the end, I was looking around for a wheelbarrow to put her in. But she made it back to the car. Thirty caches done today, and no DNFs. A very nice series. 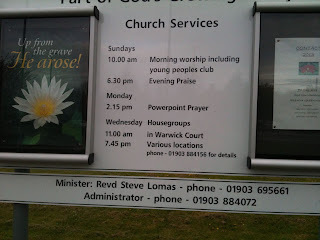 At the church near where we parked, I saw this. 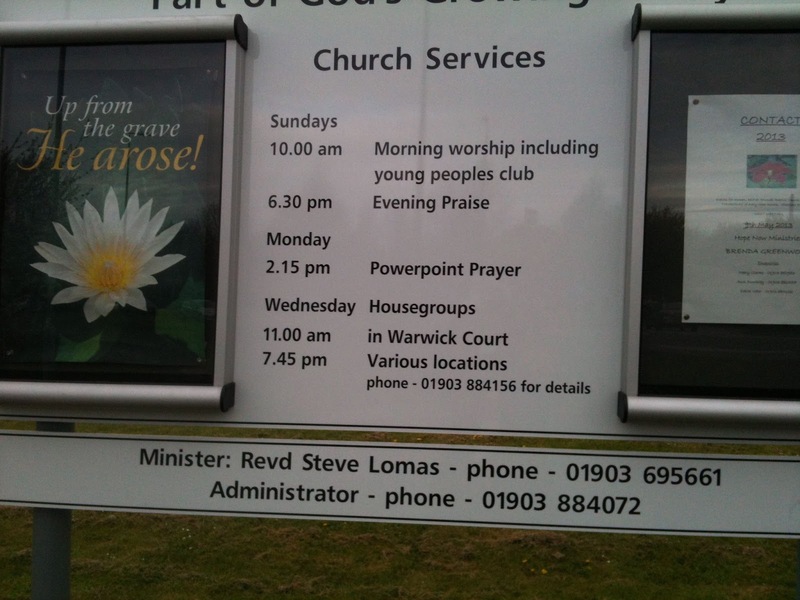 I can't help wondering what a "Powerpoint prayer" is. Disaster might be a bit of an exaggeration, but I had about a dozen DNFs, which is awful! I spent today biking round Desborough. I only managed to do 35 caches, because a DNF usually takes longer than a find. This was all on the small (20 inch wheel) electric bike, which performed just fine, but I do wish I had a usable 26-inch wheel bike. Big problems, with the big bikes. Bike 1 has a wobbly front wheel; a replacement is on a slow boat from China. Now bike 2 has failed! I was in the middle of nowhere (of course) when the motor decided to stop working. Fortunately, that had happened after the worst of the terrain, so I had a bit of downhill, and then a long bike ride on tarmac. When I got home, I investigated. The motor runs, but only in fits. If I run the wheel backwards for a few inches, then about a third of the time the motor will run for several seconds before cutting out again. I've changed the battery, the controller and the throttle, and I'm baffled. If anyone has any suggestions, I'm listening. Fortunately, I've recently sorted out my small bike, the 20 inch wheel folder. The drawback of this bike is A) no back rack, and so only limited capacity to carry things, and B) only six gears, whereas the big bikes have 21. In addition, the smaller wheel is at a bit of a disadvantage over very rough ground. Still, beggars can't be choosers - I'll be going out on that bike until I sort out one of the bigger bikes. Hurry up, slow boat! Ladysolly's out late today playing bridge, so I had a long day out; just South of Melton Mowbray. And it was a lovely sunny day, so hot I took off all sweaters and just wore a t-shirt and my light coat. First a series of 29 caches (but one was a DNF), the PC series, starting from Somerby. Then another series with the same starting point, the SyC series. And just as I got to the most southerly point of the series, the electric motor on my bike stopped working. That's very annoying, but not catastrophic, since at that point, I still have a bike that I can pedal. A very heavy bike, with two heavy batteries weighing me down, but the route from that point on was tarmac, so I was able to huff and puff to the end. I think the problem is the motor controller, because the motor itself still works, in fits and starts. Fortunately, I have a spare controller, I can take it out of the bike whose front wheel has become very wobbly. And fortunately, I still have a working bike, since I repaired the 20 inch wheel bike very recently. Then I went to Great Dalby, there's a bunch of caches around the village, mostly on footpaths, so I did it on foot. Not that I had much choice, of course. Then on the way home, I did a few more (and I met the cache owner at one cache) taking the total today up to seventy-two. 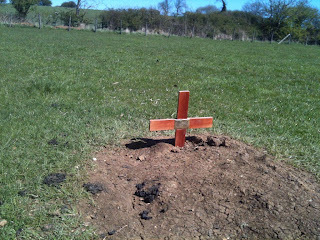 In the middle of a field, right on the footpath, I found this chap's grave.